Well, next Thursday is prom. The girls are buying their dresses and picking hairstyles and the boys are realizing that they might need a tux. But OVS isn’t the only school with a prom. Among all the news of events in Libya and the Final Four, one article caught my eye. Oliver Levin, a Boston native, wasn’t quite sure how to ask Sarah, a fellow student in his journalism class, to their prom. Levin, an avid Boston sports fan, especially when it comes to the Bruins, had a stroke of genius the afternoon before he attended a game against the Montreal Canadiens. 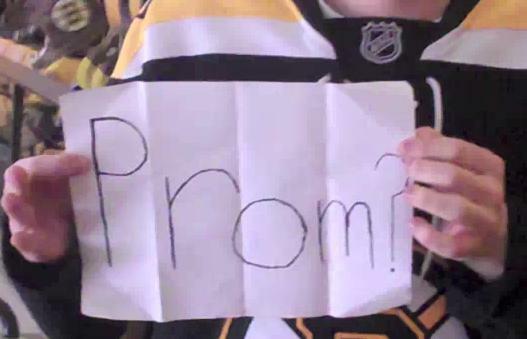 As he walked into the stadium, he had with him his ticket, his Bruins’ jersey, and a flip cam. He took several takes of his prom date appeal, and went through several ideas, from asking the whole section to yell “Hey, Sarah will you go to prom with me?” to its final takes, in which several fans lay out the idea and prepare Oliver for the actual thing. When Sarah went into her journalism class the next day, the teacher announced that random student had submitted a video to be shown in class. As the video played, the class’s confusion only grew. That is until one of the fans featured in the video said Sarah’s name. When she turned around, she was met by Levin, who was holding roses. Anyway, I thought this story was an interesting piece of news, mainly because it seems so trivial. But hey, it caught my eye, so I guess it’s got at least one reader. Oh, and for the record: she said yes. We’ve Heard Enough About Rebecca Black!